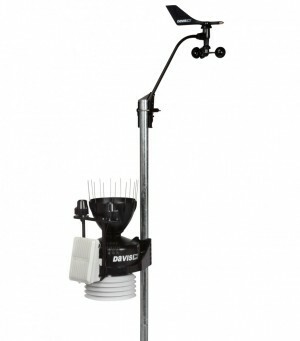 Vantage Pro2 weather stations include a display console and the innovative integrated sensor suite, which combines rain collector, temperature and humidity sensors, anemometer, solar radiation and UV sensor all into one package making setup easier than ever and improving performance and reliability. Use with WeatherLink to download data to a computer. The wireless stations were the first and only stations in their price range to use frequency hopping spread spectrum radio. The wireless Vantage Pro2s transmit and receive data up to 300 m line of sight. hurricane-force winds, yet are sensitive to the lightest breeze. Wind-tunnel tested to speeds in excess of 170 miles per hour (274 km/h). The aluminum-plated tipping bucket in the rain collector is selfemptying, corrosion resistant, and laser calibrated for exceptional accuracy. Unlike the smaller rain collectors sold elsewhere, our rain collector meets the guidelines of the World meteorological organization. Reads rainfall amounts in 0.01" or 0.2 mm increments.